By installing Estrellas mod you can decorate the night sky. Now the sky will be much more realistic, you will see a lot of glowing stars. Glowstone is great for this, and from a long distance you will not notice the difference from the real stars of heaven. Also, you can destroy unnecessary blocks, or add new ones. Or just enjoy the new view because the stars look very nice! Find The Difference map for Minecraft PE 0.15Find The Difference is a mini-game that requires a lot of attention.. 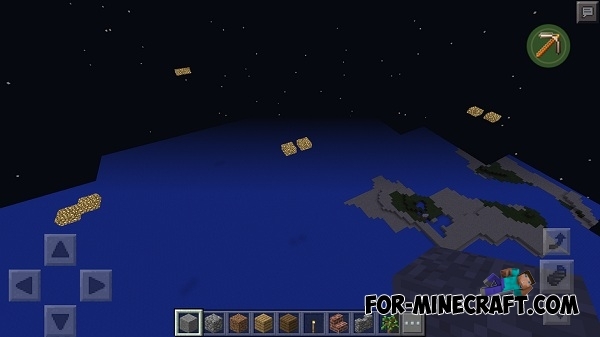 Heaven Mod for Minecraft PE 0.12.1/0.12.2Heaven Mod - a new heavenly world in your favorite game. Completely made up of blocks of diamond, the world has prepared for the players a huge treasure and a huge number of puzzles and mysteries.